Construction is expected to begin this year and a late fall 2018 opening is possible; though it may be pushed into spring 2019, according to city spokesman Marie-Pier Paquette-Séguin. Read the rest of the article here. Philadelphia’s homeless population, who came to congregate at Love. Property values dropped and, for a while, the city bemoaned the park as derelict and dangerous. But once skateboarders started arriving on the scene in the early 90s, things started to change.” According to Howell: “Skateboarders made it seem safe again. As [Philadelphia skate legend] Ricky Oyola put it, ‘If these little kids aren’t scared, why should I be scared; I’m a 30-year-old man coming home from work.’ Once it’s safe for young skaters, it’s safe for young male office workers. Once it’s safe for male office workers, it becomes safer for female office workers, then for older folks, and so on.” Read the rest of the article here. 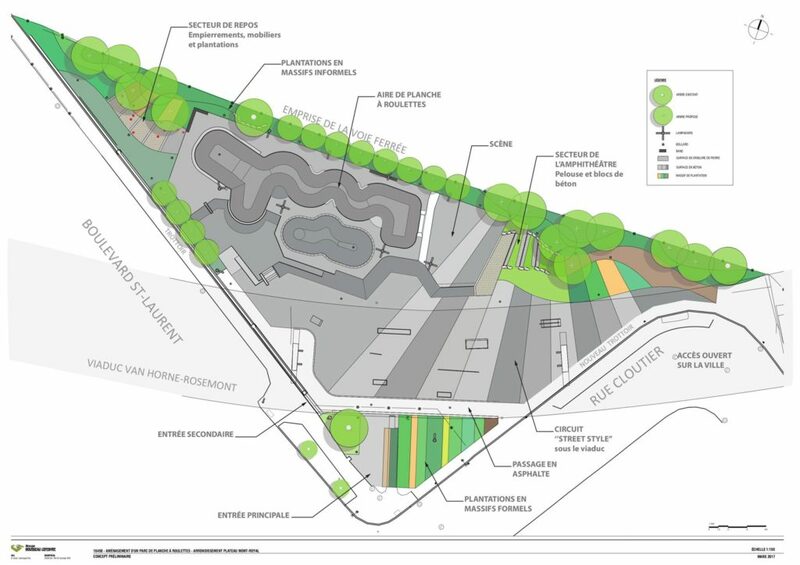 As a result, he said they are awaiting skate park design specifications from the IOC before going ahead with construction, which has been halted on the site, near the intersection of Pie-IX Blvd. and Sherbrooke St. Read the rest of the article here. Meilleur Truc Pire Obstacle from SBC Media on Vimeo. The motivation behind the project, Plourde said, was to create a space that would allow skateboarding, art and music to coexist. Read the rest of the article here. But critics say the skateboarders are damaging public property. Long black smudge marks on the edges of stone slabs are a tell-tale sign of grinding — when skaters slide their boards over straight flat surfaces. Read the rest of the article here. This Saturday July 15th in the Montreal Skate Plaza! This Saturday, July 15th there will be a cash for tricks skateboard competition on the worst obstacles in Montreal Skate Plaza! There will be $ 500 in cash and prizes from Skullcandy and LRG. Registration is mandatory to participate in the event. If you are a minor, you must provide the authorization of one of your parents or legal guardian. You can download the form, fill it out in advance, and bring the form with you on the day of the event. This event is presented by the Montreal Skateboard Association and the production partners MQC in collaboration with the borough of Ville-Marie. * In case of rain the event will be postponed to the next day, Sunday the 16th of July, 2017. A fun day was spent rolling down the streets of Montreal with the full support of the city. Check out the video recap. On Sunday, June 18, Montreal will participate in its third “Rollout” which will conclude at the Peace Park! Meet up with your skateboards at 14h30 in the Parc des Royaux (corner Rue de Rouen and Avenue de Lorimier). Departure is slated for 15:00, in the direction Peace Park, with a short stop at the corner of Berri and Boulevard de Maisonneuve to allow any beginner skateboarders to join the Rollout. Finally, at Peace Park the Rollout will host a contest (with $500 to win), BBQ, fundraising for the Montreal Skateboard Association, music and door prizes for skaters and longboarders of all ages. Join us! This day is sponsored by Pabst Blue Ribbon, MQC production partners, Société des arts technologiques [SAT] in collaboration with Ville-Marie borough.